Delta Dental's new $2,500 maximum plan is now available for quoting in bpQuote under the Delta Classis 2-99 option for 2019 effective dates. The $2,500 plan will be available shortly under the Delta Options 50-99 option. 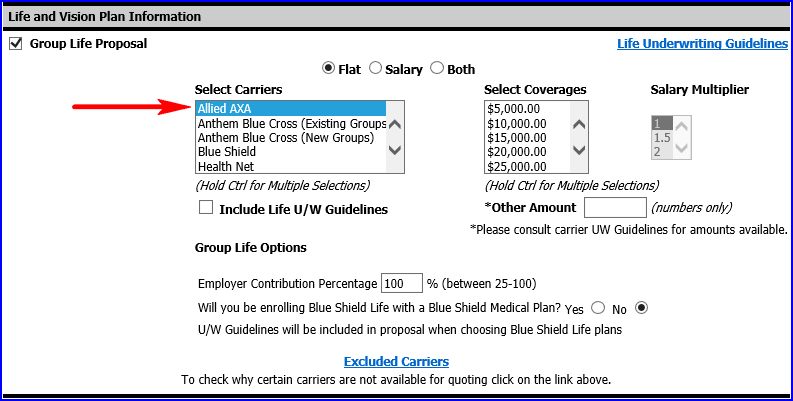 AXA Life Insurance plans can now be quoted through bpQuote as part of the Allied Benefit Suite. Groups wishing to enroll in AXA Life Insurance plans are required to have Delta Dental coverage (current or new). Through the Allied Benefit Suite, groups can also elect AXA Long Term Disability, EyeMed Vision, and the Personal Protection Plan. All products except the AXA Long Term Disability can be quoted in bpQuote. Please contact a member of your B&P Sales Team if you'd like a Long Term Disability quote.